In our research time on Friday mornings we have begun to study the history of musical instruments. In cooperative groups, students have been given the task of finding out about their assigned instrument, and more specifically, how it evolved into the instrument it is today. 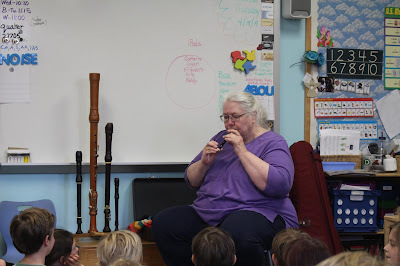 To help us with this task, Kathy Schenley, our talented resource teacher, visited River Class and shared her family of recorders and viola da gamba. River students learned all sorts of interesting facts about whistles and how they evolved into instruments that were able to produce more precise notes, like recorders. Kathy shared the more familiar recorders like the soprano and alto and the less familiar ones like the bass and the Garklein, which is the smallest recorder. Saxophonist, Jim Henderson is Annie's special guest in dance class. 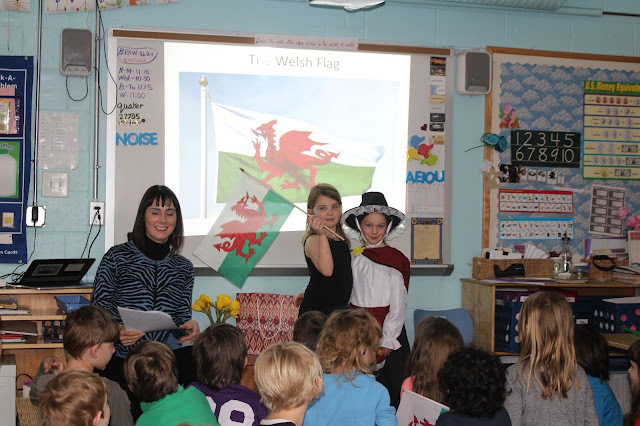 On Thursday, February 28th, my mom, Ingrid, came to share about Saint David's Day, which takes place on March 1st. My mom told us the longest place name in the world and the story of the red dragon and the white dragon. One of the students got to try on the traditional Welsh costume. The leek represents the boy and the daffodil represents the girl. My mom even handed out Welsh flags! We are inviting parents to come and share their musical gifts with us. We welcome anyone from novice to experts. John recently came to share a number of instruments including a Hawaiian guitar (pictured above), two types of flutes, a mandolin, and a banjo. Earlier in the school year, Tom (pictured below) came to River Class to share his Spanish guitar. We look forward to more musical shares as the year progresses. Thanks to all the parents who have volunteered! We recently celebrated our 100th Day of School. Fun was had by all! We began with calendar time and children were very excited to say 100 in unison. Children shared their collections of 100 with each other in cooperative groups. Students had fun guessing what was in the boxes. Students set up their collections ready for Sky Class students to visit. We had a large variety of collections and children were creative in how they set them up for viewing. Our day was filled with 100-themed activities. These included making necklaces with 100 beads, decorating glasses and crowns, reading a 100-day story, bouncing balls, shooting hoops, jump roping, and more. Now it's time to start the countdown to summer vacation! We've had a lot of fun in River Class lately. Three special guests have delighted us with their talents and expertise. Plus, we had our second birthday celebration (one more to go). Michael, a previous River Class parent and former sound designer came to talk to us about sound. Bill, an engineer and current parent of a senior, came to talk to us about safety. Ken, a scientist, came to show us some chemistry magic. In our sound lesson with Michael, he played with pitches of some of the students’ voices, making them sound very different, much to the children's delight! 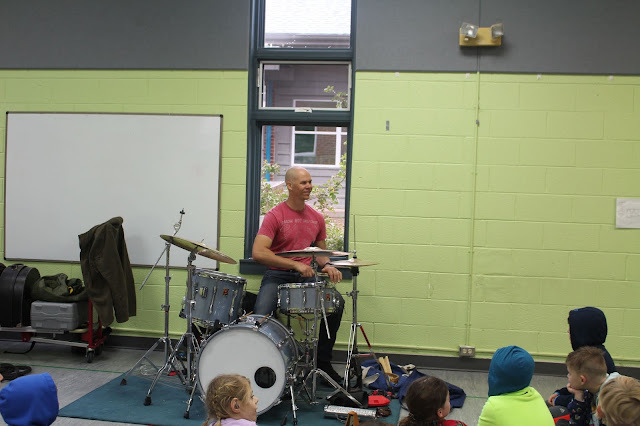 He even played a sound so high, that the kids could hear it, but not the adults! He demonstrated that humans have a rudimentary echolocation, like a bat and showed us a sound "magic trick" called the McGurk effect, which (for most people) demonstrates that what we see can affect what we hear. We had a terrific first dance class with Annie, our wonderful dance teacher. 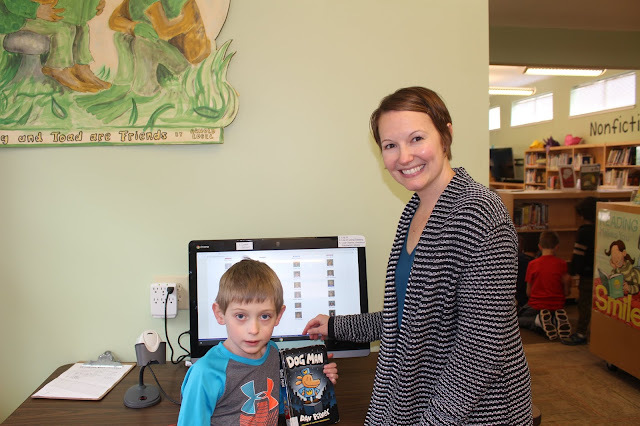 Annie typically begins the class with a story, which she reads to the whole class. The movement part of dance is done in halves. Today we had two stories: Black? White! Day? Night! : A Book of Opposites, by Laura Vaccaro Seeger, and Dance! by Bill T. Jones. River students enjoyed the chance to explore both of these books under Annie's direction, making predictions about the opposites. Bill T. Jones' book showed us how we can move parts of our body and/or our whole body, which we further explored in dance class.